Although we always like to bring readers clear news about upcoming devices, there are some occasions when we’re simply confused. A case in point regards the Samsung Galaxy Mega 6.3 or 5.8 coming to Rogers, but at this point in time we cannot clarify which one a leak refers to, as it actually details a device called the Galaxy Mega but with a 4.8-inch display! We’re always interested to hear leaks about upcoming devices but one that we’ve come across today has us pondering. A report tells of “confirmation” that Rogers is to release the Samsung Galaxy Mega 6.3 in September, according to a leaked internal document. However, the image shown to back this up actually shows a device listed as the Samsung Galaxy Mega with specs including a 4.8-inch display, 1.6GHz dual-core processor and 8-megapixel rear camera. Many readers will have heard of the Samsung Galaxy Mega 5.8 and also 6.3 but a 4.8? It hardly fits the bill of a ‘phablet’ device for a start, even though it’s listed as a “large screen LTE Max smartphone with affordable price.” At first we thought this could be a misprint with the size of the display and it simply should have read 5.8 or 6.3 instead of 4.8. However the processor that is listed on the leaked internal document doesn’t fit with either of those devices. The Samsung Galaxy Mega 6.3 has a 6.3-inch display and 1.7GHz dual-core processor while the Galaxy Mega 5.8 has a 5.8-inch display and a 1.4GHz dual-core processor, although they both have an 8-megapixel rear camera. This is one of those occasions that has got us simply scratching our heads so we thought we’d give you the details to get you wondering too! 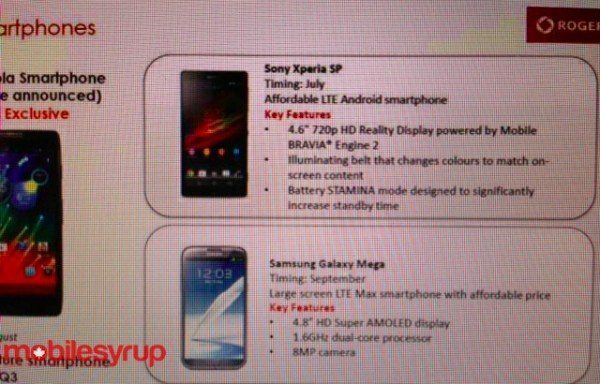 The same leaked document also shows the Sony Xperia SP arriving on Rogers this month, and you may also be interested in another recent leak suggesting that in Canada the upcoming Motorola Moto X phone looks to be coming to Rogers as an exclusive. You can be sure that if we receive further information about the launch of a Samsung Galaxy Mega device on Rogers we will let you know. In the meantime we’d like to hear your thoughts on this. Would you be interested in either the Galaxy Mega 6.3 or 5.8 on Rogers? Let us know with your comments.